Bianchi illustrated the cover of the debut album of the progressive power metal band Vision Divine, which was voted by metal and hard rock fans as the second-best album artwork worldwide. Bianchi’s other album cover work included "Sigma" by Athreia Records, and Labyrinth’s album, Sons of Thunder for Metal Blade Records. That same year Bianchi became a full-time teacher of Anatomy for Comics at the Scuola Internazionale (International School) di Comics in Florence. In the 2000, the School, along with publisher Calvin Edizioni, published Echi, Bianchi’s first art book, highlighting his varied works over the previous three years. In 2001, began working for Direct to Brain, one of the leading 3-D video production studios in Europe, doing character design, storyboarding, scene design, graphic design and artistic supervision of 3-D modeling. Among his clients included hip hop/reggae group 99 Posse’s “Stop the Train” (for BGM Records), “Kitchen Tools” for Virgin Records, and “Per me per sempre” (“For Me Always”) for BGM. In November and December that year, Bianchi did work for Fantasy Flight Games’s role-playing game Dragonstar. He also painted a poster for the Scuola Internazionale di Comics in Florence, illustrated Vision Divine’s album Send Me an Angel, and taught a second illustration course at the Accademia di Belle Arti in Carrara. In 2002 Bianchi, working for Pegaso, illustrated the four elements of earth, air, fire and water, on which resin sculptures were based. That summer, he published his second art book, The Art of Simone Bianchi. He also painted five illustrations for Eldec, and worked again for Direct to Brain, this time for a Coke commercial. That December, he began work writing and illustrating the first volume of Ego Sum, for Vittorio Pavesio, the 44 pages of which took him most of 2003 to fully paint. The first volume of Ego Sum was published in hardcover on January 16, 2004, in Italy, France, Canada, and Luxembourg. The second volume followed that year. In 2004 Bianchi attended the annual Festival International De La Bande Dessinée (International Comics Festival) comic book convention in Angoulême, France, where he met Sal Abbinanti, a comic book penciller and the personal agent of American comic book painter Alex Ross, which led to Abbinanti signing Bianchi as one of his clients. In the Fall of that year, Bianchi painted the cover of an issue of Atomika, a comic book created by Abbinanti and Andrew Dabb that debuted the following year. In October 2005 Bianchi's third art book, Onirika, was published by Vittorio Pavesio Productions and presented to the public at a convention in Lucca, for which he painted the official poster, on which he collaborated with his sister Gloria. In mid-2004, Bianchi lived in New York City, and met artist Mike Bair, whose work Bianchi admired. Bair introduced Bianchi to DC Comics editor Peter Tomasi. 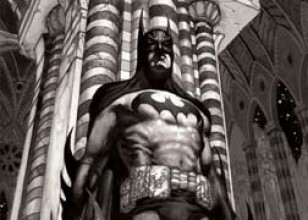 After a few proposals, Tomasi gave Bianchi Grant Morrison's script for Seven Soldiers: Shining Knight, which became Bianchi’s first American work. ; it was published in 2005. The same year, Bianchi did his first American work for Marvel Comics, illustrating a number of covers for X-Men Unlimited. Bianchi’s illustrated the interiors of Green Lantern #6 (December 2005), and subsequently illustrated the covers for issue #8 (March 2006) to issue #13 (August 2006), which were written by Geoff Johns. Bianchi first ongoing monthly work for an American Marvel book was Wolverine #50 (March 2007) to issue #55 (September 2007), which was written by Jeph Loeb. 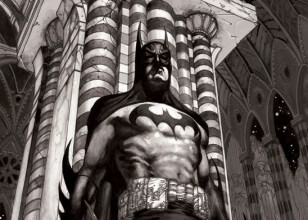 To highlight the look of Bianchi’s ink wash work, each of these six issues was offered to readers in both a color and black-and-white version. Bianchi’s other Marvel work includes covers for Ultimate Origins, Astonishing X-Men and Thunderbolts. 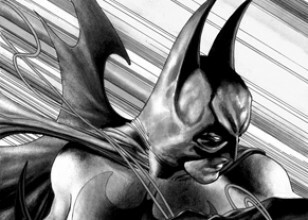 Bianchi also illustrated the covers of Batman, from issue #651 (May 2006) to issue #654 (August 2006). Bianchi signed a two-year exclusive contract with Marvel in February 2006, citing his childhood love of the superhero genre, and his greater familiarity with Marvel's characters. 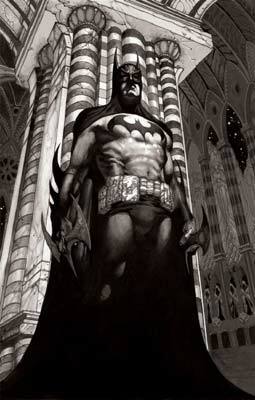 Though his contract precludes him from doing any European work, it allows him to continue the cover work he began previously for rival DC Comics’s Detective Comics, which ran from issues #817 (May 2006) to #839 (February 2008). Bianchi also hopes to continue his work on Ego Sum, the third book of which he has yet to begin, though he has not spoken with Marvel as to whether they would publish it in the United States Bianchi and writer Warren Ellis together worked on Astonishing X-Men, having taken over the book after the departures of Joss Whedon and John Cassaday. Following this he provided the art for the limited series Thor: For Asgard written by Robert Rodi.